FRIDAY, Feb. 10 (HealthDay News) -- Most children and teens who deliberately injure themselves are discharged from emergency rooms without an evaluation of their mental health, a new study shows. For the study in the Journal of the American Academy of Child & Adolescent Psychiatry, researchers examined Medicaid data for adolescents aged 10 to 19 years. Only 39 percent of the patients discharged after trying to harm themselves received a mental health assessment in the emergency department. Only about half of the children who had visited the ER for a mental health-related reason within the previous 60 days received a mental health evaluation during their visit to the ER for self-harm. Up to 90 percent of young people who deliberately harm themselves meet criteria for at least one psychiatric disorder, particularly mood disorders, the researchers said. 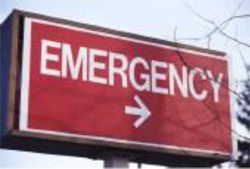 The U.K.'s National Institute for Health and Clinical Excellence recommends that people who show up in an emergency room for self-harm should receive a mental health evaluation before being released from the hospital. "This study highlights the need for strategies to promote emergency department mental health assessments, strengthening the training of physicians in pediatric mental health and adolescent suicide prevention and timely transitions to outpatient mental health care," Bridge said. The American Academy of Child & Adolescent Psychiatry has more about self-injury among teens.